I wanted to write a big old personal post on my illness and everything. But won’t lie, it’s hard to write. Both in an emotional sense and a literary sense. But if you didn’t know, I have ME, also known as CFS, google will explain it better so if you’re interested give it a lil’ search. So instead I wanted to jump in with more informative bits on how I do things despite my ME. And today we’re talking how I stay fit and healthy with a chronic illness. This was inspired by Ali Hemsley, a fellow chronic illness queen and one of my favourite blogs out there! My fitness journey since having ME has been a bloomin’ rollercoaster. It has it highs and low. Sadly with my illness I tend to have stages where I will only eat one meal a day. If that. And will loose a lot of weight because of it. I don’t recommend that if you can prevent it – it isn’t healthy. I also have stages of binging like mad. Again, not healthy. But if you’re suffering with any sort of long term or short term illness. Whether it be physical or mental. Here are my tips on how to stay healthy and fit. I want to stress the fact that you can do this. I was at a point I felt I couldn’t do anything but so long as you listen to your own body and take the breaks you need. It was hard to get back into fitness, I get that. I used to be able to wake up at 4/5am and run a few miles before my day starts. And I expected I’d still be able to. Nope. But you’ll be okay. Just don’t push yourself over the line. And especially if you’re suffering with something like ME, then staying healthy can really help. So here we go. Is this obvious? Kind of. But when I’ve been ill I’ve just ‘worked out’ I didn’t plan or know why I was working out, and I didn’t really get many results from this. I also just didn’t feel motivated. So set yourself goals, whether its to build abs or a peach or just to feel healthier and happier in your body. It’s important to give yourself the drive. And don’t give yourself these mad goals. When I first started getting back into fitness I wanted to be able to run miles at 5am like I used to and it’d hit me hard when I couldn’t. So I then set my goal to feel a little bit more healthier and just to sweat out this gross feeling I had inside me. And since then I’ve been able to tackle goals such as growing muscle. I’m no dietitian. But my few months in dance training taught me a lot about what was going into my body. As to whether I listened to it is another story. A dancer’s diet is basically as much protein as possible and as little carbs and sugar. And for about 2 weeks I stuck to it and it was fine. I might write a post on what I eat in a day, however to give you an idea, it was a lot of sweet potato and Greek yoghurt. But when carbs and cheese are a gal’s best friend, this sort of diet comes with a lot of withdrawal symptoms. So I decided to throw the food diaries out the proverbial window and do my own thing. I don’t stick to diets, I just try to eat as healthy as possible. And that’s what works for me. So my advice is listen to your body, try get the protein and high energy foods in you. As, especially when living with a chronic illness, it really helps get you through the day. Create your own system, as everyone’s is different. Maybe try supplements and vitamins if you find it hard to get everything you need in your diet. You do you. I mentioned this is the previous heading, but it applies to staying fit and healthy all round. I like working out in the mornings. But I can wake up and my body needs a few hours to really get going, so I leave it till the afternoon. Sometimes my body is like heck no. And sometimes I know I can push myself a little more, so I do. Listening to your body is so so important. Only you know you best, and you can’t force yourself to do something you know will push yourself over the limit. You’ve got to look after yourself before anything else. The abs will come, you’ve just got to be patient and listen to your body. This does apply to anyone with working out. I also have dodgy knees so things like sprinting which I used to do, aren’t a frequent option. But sometimes they’re okay, it’s just a matter of reading the signs, as there’s a workout out there for everyone! So although when I first started getting fit again I really couldn’t do it more than once a week. I began to try find more balance in my routine. Instead of doing maybe one big workout once a week do 5 minutes every day. A little bit a day can go a long way, and I think it’ll become more of a motivator to then try push beyond those 5 minutes. At your own pace though. Also just choosing the healthy option. Okay maybe you could take the stairs or just have a quick walk. Which is great for relaxing and is exercise! Also just eating the right foods so you don’t feel groggy. Trust me, I wouldn’t work out if I didn’t enjoy it. And I did have to take a few weeks break as I wasn’t enjoying the stuff I was doing. Because especially when my body can get very painful and worn from exercise, if I don’t have fun I’m just going to give up. Whereas if I’m enjoying it then I’ll stay motivated. As I said, there’s a workout for everyone. You’ve just got to find it. If you like a boogy definitely take dance classes as you will be dripping by the end. But there’s also swimming, rowing, sports – and so on. Also, find yourself a buddy. Someone to keep you company so you’re not stuck in your head. Maybe being a part of a teams your thing. Or maybe staying in and being able to workout from the comfort of your own home is your choice. Whatever makes you feel most happy and motivated to workout. Because you have to want it. 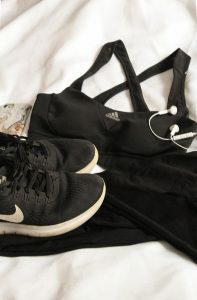 There are my tips on how I work out despite my ME. Maybe I’ll write more personal bits about my illness but I really want to add more of a fitness element to my blog. And more of a pro-active chronic illness view point, because you can 100% do it! I love that you’re adopting the motto of listening to your own body and doing what works for you, especially when it comes to food. So many people want to tell others what they should be eating but it’s such an individual thing. This was really helpful! I love the part about enjoying movement, I couldn’t agree more! Aww thank you I’m glad! This is such a great post! I love the tip for listening to your body (because that is SO true!) and finding something that you enjoy. It’s so hard to want to work out if you aren’t enjoying the process. These are such simple rules but even though I dont’ have a chronic illness, i feel like you can apply these rules to just about everything. The fact that you’re listening to your body is amazing. 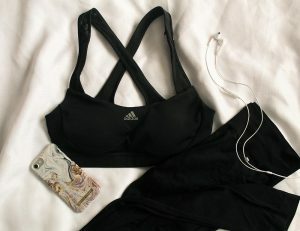 I do too which is why i don’t work out during my period because my energey is very drained during that time. I move but I dont’ give myself big training sessions.